You must make reservations at least 5 minutes in advance of the time at New Mill Restaurant. Wide screen TV's in bar. We offer a dining room for up to 80 guests for private dining. Plantsville's well-known Old Mill is now New Mill Restaurant, featuring the culinary talents of its new Executive Chef, Bob Martucci. This lovely 1737 cider mill has been a Connecticut favorite for many years, and has now completely renovated by its owners, Chris and Michelle Calvanese. Menu specialties include fresh-only seafood and raw bar selections, "chop house" Angus steaks, and homemade pastas and desserts. An expanded wine list and a large sociable bar round out the new offering. We live in the area but had never been here before. . I was impressed. Our waiter was fun and professional. The pork chop and veal chop were both delicious. When I had to return my pork chop because it was undercooked to me and they forgot to bring it back out as soon as it should been available they quickly apologized and offered a free dessert. A restaurant does not have to be perfect for a five star. Looking forward to returning. We have been dining here for about a year or so. So, so glad we found this place! It quickly became one of our favorite restaurants and we try to visit at least once a month. I always order the Lobster crusted Cod and my husband loves the pork chop! The food is always spot on! The servers are great and I love how they decorate for the seasons. Food was great. Service was awesome. Love the atmosphere. I wish all seating could have a little more of the feel when you’re around the fire place and bar and not such much off in the side area. We started with the Antipasto which was very good. I had the Chicken and Shrimp Picatta over mashed potatos and veggies. It was very good, the lemon sauce was very tasty. My husband had the veal special which was also excellent. Nice atmosphere and the decor is very nice. The staff, food, ambiance and atmosphere is excellent. The food was outstanding! We will certainly go back. The atmosphere of this restaurant is very cozy & rustic. 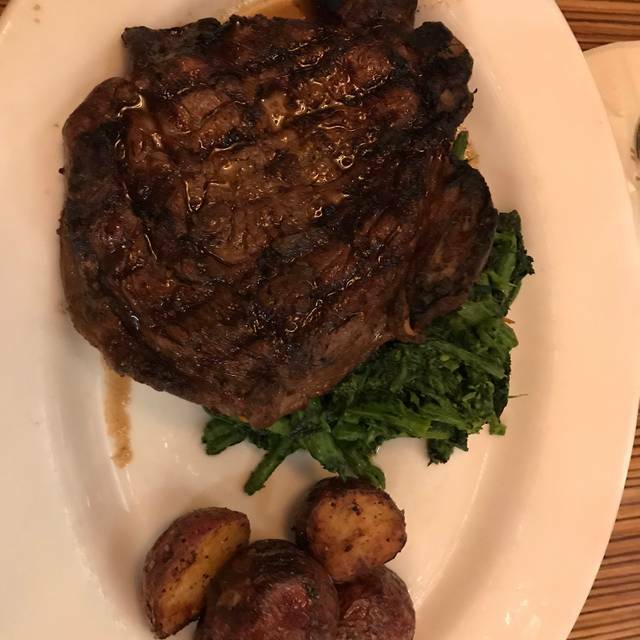 I had the filet mignon which was amazing even though I had to send it back to cook a little more, it came out fast and delicious. Exceeded our expectations & will be back soon! Upon arrival, we found it very difficult to park. I am handicapped and there were no spaces available. Regular parking was also very difficult. I reservation was honored and our table was clean and comfortable. Our server made our evening enjoyable. She was knowledgable of the menu and specials and was attentive without being intrusive. We look forward to returning with friends. Excellent service, great drinks and food in an inviting atmosphere. This was our second time here. Our waitress Michelle (short brown hair) was excellent, so service was 5 stars. The main complaint was that it was so loud in there, we couldn't hear eachother talk. Other tables were bothered by the noise level as well. There was a larger table of people who were bar room loud and obnoxious. While not necessarily the restaurant's fault, it would be nice if larger groups were in a separate area. We were seated in the lower level. Last time we were seated in the upper level, which was quieter and more relaxing. Next time, we'll request that area. The food was good overall. I had the cod, and the lobster crust on top was overdone and dry. The dish also needed more sauce. There was hardly any. However, the short rib ravioli and clams casino were amazing. Overall it was a good experience and we'll be back, we just couldn't wait to escape the noise. Food was awesome. Service was great. Will definitely go back! Excellent. Very pleasant and helpful wait staff. Love their dinner menu but Would love to see a varied dessert menu now and then. We followed up last weeks Valentines dinner with a dinner with friends. The atmosphere as prior week was a buzz and nice and rustic. A lot of active in the back room and quite warm but got better as crowd thinned out. Apps were good clams casino tasty. Littleneck clams were tiny for the money. Antipasto was good. Dinners were the star of the show again bone in and out fillets for my friends and the stuffed rigatoni and ravioli for my wife and I were very tasty. Tres Leches and a nice night cap of Zambucca was a nice end to the evening. Will be back. The menu had many options and the food was fantastic. The homemade pasta was excellent! Highly recommend this restaurant! My family enjoyed a night out. The food, as always, was outstanding. The staff was kind and friendly. The inside of the new mill is absolutely beautiful and I would recommend this restaurant to everyone. This is the 2nd time going to this restaurant. It is the BEST!! I wish I lived closer (we're in Marlborough,CT). It was our 30th Wedding Anniversary that we were celebrating and were in this romantic booth in the corner with curtains, etc.. Nice touch. I'll be calling soon for a reservation for my husband's 30th birthday in September. New Mill is on the top of the to 10 list. Staff was be on helpful. Thank you. Great restaurant. Especially love the ambiance and service. Will definitely be back! This is one of the best restaurants in all of Connecticut. Excellent food, drinks, and service for an extremely reasonable price. My wife and I really enjoyed ourselves for Valentine’s Day dinner. The ambiance and feel is very comfy, we felt like home. The drinks were ok not much different on tap and expresso Martini tasted like Kahlua and vodka was sparse. For appetizer we choose the meatballs and was shocked to see 2 tiny ones, for $15 yikes. Dinner was the star of the show. My wife had the lobster crusted cod really good and I had the lobster and scallops over black pepper fettuccine, we both enjoyed them a lot. Great value for the price. Finished off with tortufo which capped it off. Thanks for a nice night! Extremely impressed with our first time dining at The New Mill. We were seated by the fire place. The atmosphere was great, our waitress was great and we cannot say enough about how great the food was. We will definitely recommend The New Mill, to all of our family and friends, and will dine in again hopefully sometime soon. Great fantastic food, courteous service and excellent vibe ambiance. Food was excellent! Our server was friendly, warm and enriched our experience. I was treated to a birthday dessert on the house which was tasty and so kind! Banana creme brulee highly recommended, as well as any of their dishes and drinks. Will definitely return! We have been going to the Mill for over 25 years. It has changed over the years for the better. We brought friends who have never been there and they loved it. The food was outstanding as always. We had a wonderful evening. The food was delicious and the service was terrific. I would definitely recommend. Our new, local place to dine! Why did we wait so long to try it?! Friendly -- and knowledgeable -- wait staff. Meals were absolutely delicious. 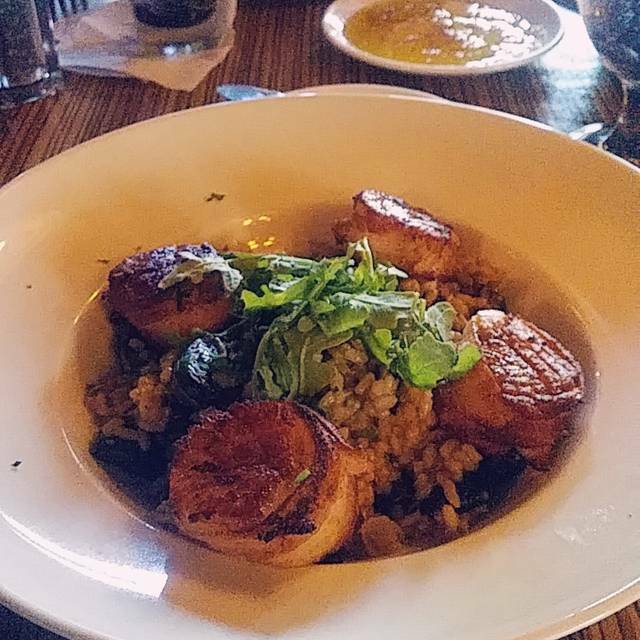 Ordered the specials of the night (Diver Sea Scallops and a Chicken Pasta) and the Banana Crème Brulee is a "must try." Pomegranite Martini and a Ketel One Martini were perfectly made. (Yes, you can screw up a martini.) We were lucky they had the holiday decorations still up -- I wonder if that added to the "coziness" of the restaurant? Was really pleasantly surprised with this place. Our waitress was very attentive and pleasant, I absolutely LOVED the atmosphere with the winter decorations, and the food was fantastic. Get the burrata. The food was amazing and our server was awesome! I highly recommend going here. There is only 1 issue here. Its the parking. You have to be very careful parking, and it appears that the owners and or some of the crew park on the front sidewalk, which makes it extremely dangerous trying to exit, as you can not see oncoming traffic. I mentioned it to the manager, but nothing was done about it. Its the only really bad negative for an otherwise awesome experience. Our experience at the New Mill was wonderful. 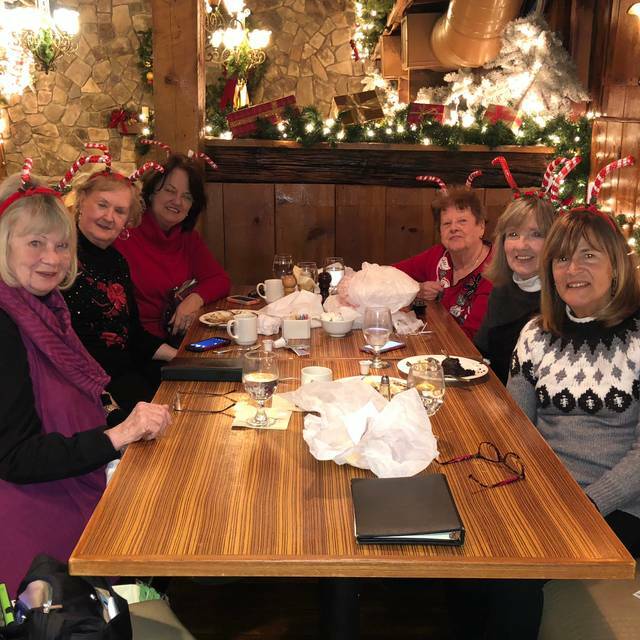 The restaurant was still decorated for the holidays which added to the delicious food and the prompt and friendly service. We will return from time to time.